The Mail’s campaign to clean up Britain is off to a flying start. More than 14,000 volunteers signed up following Saturday’s launch – and the Prime Minister has promised to join them. The Great British Spring Clean, in partnership with Keep Britain Tidy, aims to recruit an army of public-spirited readers for the war on litter in our towns and countryside. Building on the success of last year’s Great Plastic Pick-Up, it will involve thousands of organised litter collections to make Britain beautiful again. By last night more than 14,000 had registered for the month-long event, which starts on March 22. Theresa May praised the campaign yesterday, and vowed to take part in her constituency. ‘I’d like to congratulate the Daily Mail on their anti-litter campaign – a fantastic initiative which we can all play a part in,’ she said. ‘By helping to collect and dispose of single-use plastic on our streets, in our parks and on our beaches, we can make a real difference to our communities both now and for generations to come. Environment minister Therese Coffey also threw her weight behind the campaign. 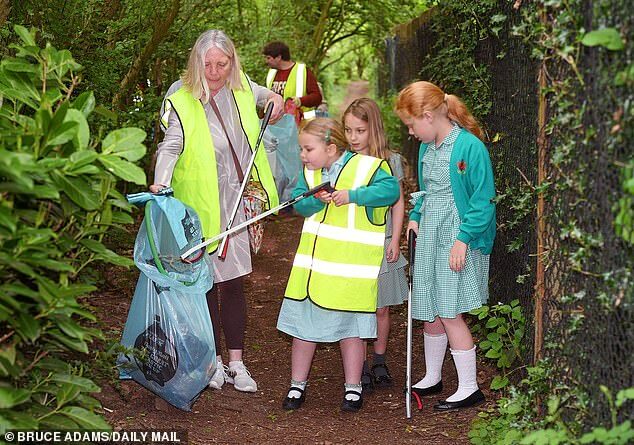 Saying that picking up litter was used as a ‘punishment’ when she was a schoolgirl, she called on Britons to see the task as ‘not only the right thing to do … but something which we are actually proud to do’. On Saturday the Mail urged our army of loyal and caring readers to fight the scourge of litter blighting our towns, shoreline and countryside. The campaign has already been backed by the United Nations and a string of celebrities and campaigners, including Sir David Attenborough, Michael Palin and Jeremy Corbyn. Last year some 370,000 took part in the Spring Clean. This year we hope to sign up half a million to help stop litter harming wildlife and making the country look like a rubbish tip. The event also aims to build on the success of last year’s Great Plastic Pick-Up, which involved more than 20,000 people over a weekend. It also comes after more than 30,000 Mail readers enlisted in our Christmas campaign with Helpforce to volunteer in the NHS. Morrisons is giving customers the option of using large, reusable paper bags in eight stores from today. The US-style 20p paper bags, which can be reused and ultimately recycled, have the same capacity as standard plastic carrier bags. To further reduce plastic use, Morrisons is increasing the price of standard plastic carrier bags from 10p to 15p. The paper bags are sourced from responsibly managed forests, the supermarket said. TV presenter Julia Bradbury said: ‘I don’t think there’s anybody who doesn’t know now that there’s litter on our beaches, on our coastlines, on our country paths, in our cities – it’s everywhere. 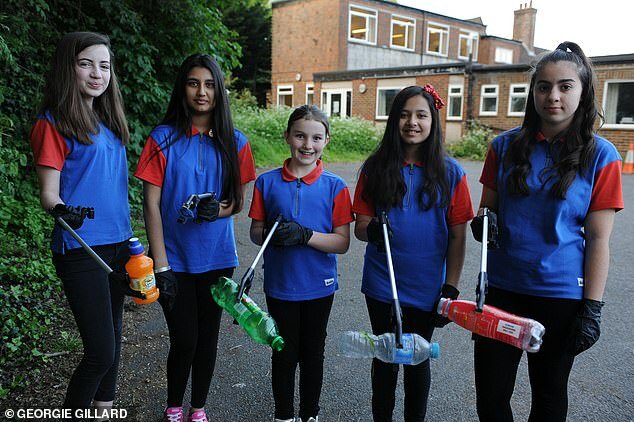 The Chief Scout, Bear Grylls, said: ‘Litter-picking fits in with core Scout values of care and respect and helping out whenever you can. A shocking 30 million tons of litter are collected from Britain’s streets each year, and 2.25 million pieces of litter are dropped on the streets every day. Eight out of ten people have said they are ‘angry and frustrated’ by the amount of litter in the country, and the cost to councils is estimated at £1billion a year. The Mail has long campaigned for a reduction in plastic waste, successfully lobbying for a 5p charge to reduce single-use plastic bags, a ban on toxic plastic microbeads from cosmetics and a deposit return scheme on bottles. Mrs May added: ‘Since the introduction of a 5p charge for using a plastic bag, in 2015, we have taken over 15 billion bags out of circulation. This means the marine life around our shores is safer and our towns and villages are cleaner. The Great British Spring Clean will run between March 22 and April 23. Registration is open online at www.gbspringclean.org. A charity has been forced to spend more than £1 million clearing up fly- tipping and litter from British woodlands in the past five years. The Woodland Trust said the annual bill for clearing up the illegally dumped mess on land it owns and takes care of was £200,000 in 2018. Over the past five years, clean-ups have cost £1.1 million. 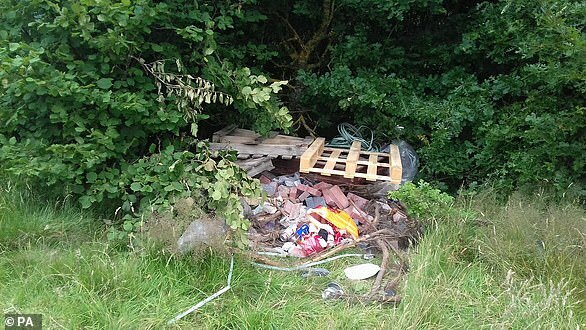 Woodlands are being used for hundreds of incidents of fly-tipping and littering, with waste found ranging from fridge-freezers and mattresses to carpeting and oil drums. 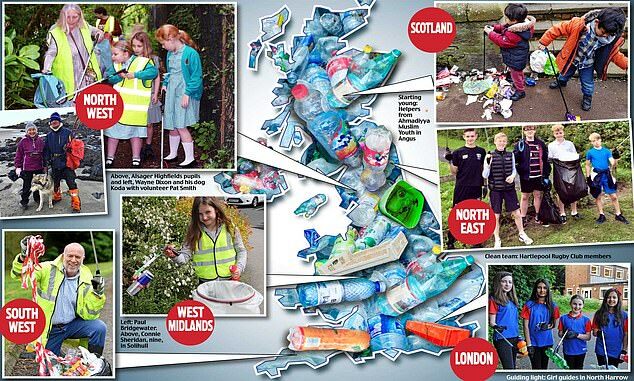 Last May, volunteers from across the UK turned out in force for the Daily Mail’s Great Plastic Pick Up. Some were so inspired by our campaign that they’ve been meeting up for regular events of their own, gathering friends, colleagues, relatives and neighbours to join the fight. But all are united in the conviction that this year’s Great British Spring Clean will be the biggest yet. We catch up with some of the litter heroes who’ll be returning for this year’s campaign. Why don’t you join them? Town councillor Sue Helliwell, 56, has recruited more volunteers for a pick-up in Alsager, Cheshire. ‘Alsager’s litter is mainly plastic bottles and takeaway cups,’ she says. Elaine Beesley, 45, a web developer at Edge Hill University, helps run the Burscough Litter Pickers in Lancashire. 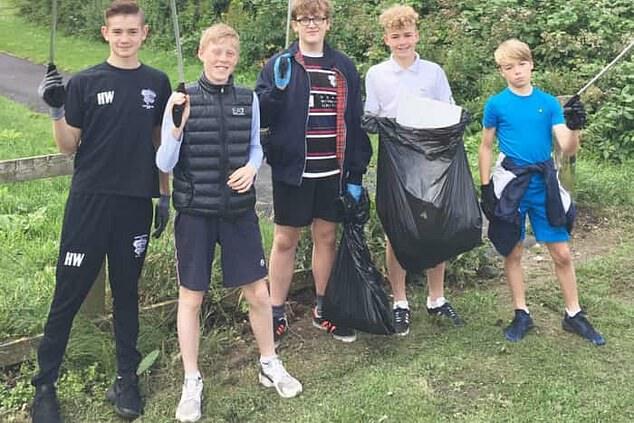 Retired police officer Andy Wright, 48, organised a pick-up at Fred Longworth High School in Tyldesley, near Wigan, during a ‘fun day’ last year that ‘no doubt’ raised awareness of litter. Wayne Dixon is half way through an 8,000-mile walk around Britain’s coastline with his dog, Koda. The Army veteran, 47, is litter-picking on his way to raise money and awareness. Stewart Hind drummed up support at Hartlepool Rugby Club, recruiting up to 40 people to pick up litter last year. Special needs students at Castle School, formerly The Centre, in Ashington, Northumberland, joined our campaign. Cathy Brotherton held a clean-up last year after becoming frustrated at the piles of rubbish left on roads between Dewsbury and Huddersfield. ‘The amount of takeaway containers, beer cans and bottles thrown out of car windows on to verges and into fields, which then get smashed, injuring the animals, is unbelievable,’ she says. Chris Dunster, 50, from Olton, near Solihull, says: ‘The Spring Clean enables us to do a targeted approach and collect en masse a whole lot more litter than normal. Alan Preece, senior warden at the Saltwells Local Nature Reserve in Dudley, will be rallying volunteers to take part this year. ‘As an urban nature reserve, we do get litter and fly-tipping, ranging from cigarette butts to three-piece suites,’ he says. Janice Cain, a stock controller from Northampton, became an ambassador for Keep Britain Tidy after joining last year’s Great Plastic Pick Up. 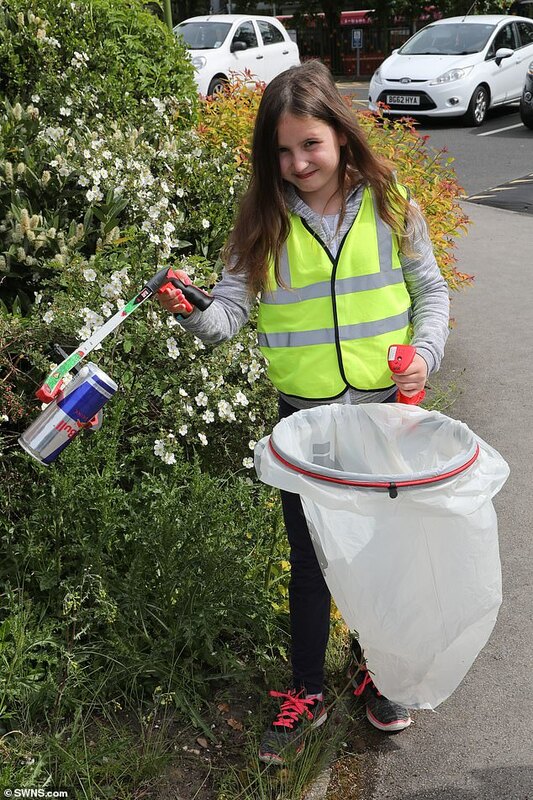 ‘I’m interested in protecting the environment and clearing up plastic,’ says Miss Cain, who this year will be joining The Great British Spring Clean. Dundee-based Shoaib Khan, 37, is a regional youth leader for the Ahmadiyya Muslim Youth Association. During the Great Plastic Pick Up, he took volunteers to Corrie Fee, Angus. Grandmother of three Lynnette Knight has doubled her volunteer team from six to 12 people since last year’s Daily Mail plastic pick-up campaign. Recruited via a community Facebook page in Barry, South Wales, members raised money in order to buy their own litter-picking equipment. 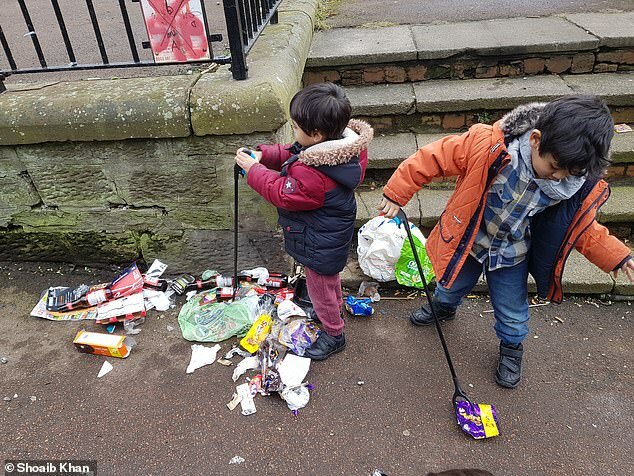 The retired conference manager, 65, says that for her five-year-old grandson, picking up rubbish has become second nature. ‘My grandchildren took it really seriously,’ she explains. Karen Harrison, 64, took 6th A Headstone Girl Guides out litter-picking in North Harrow last year. ‘It was really successful from our point of view,’ says teacher Karen. 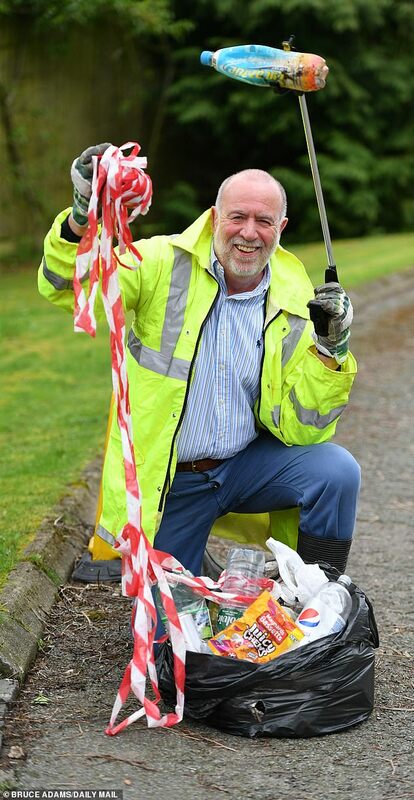 For former bank manager David Hewett, litter-picking is a retirement project. The 76-year-old walks between Putney Rowing Club and Kew Bridge Road once a week collecting rubbish on the pedestrian path, where dog litter bags, bottles and plastic bags are commonplace. Bradley Smith, 30, is a community warden supervisor at Sudbury Town Council. After last year’s successful plastic campaign, his team is aiming to make an even bigger impact in their area, starting with local schools. They are visiting six in the town and encouraging them to get involved in The Great British Spring Clean. ‘We’ll really push it this year because we did so well last year,’ he says. Ian Hudson, 66, organised a pick-up in Bishops Stortford, Hertfordshire, last year and will be holding another in March as part of The Great British Spring Clean. Art worker Owen Burton, 20, gathered together 12 members of his family to clean an area of Shoeburyness, on the Thames Estuary, last year and he says that he will be joining The Great British Spring Clean campaign this year, too. Last year, Jean-Louis Button incorporated litter-picking into his fitness regime, stopping to pick up rubbish every time he went running in Bletchley in Milton Keynes. David Rawle, 67, organised a 20-man pick-up with Cranfield Tae Kwon Do Club last year and is keen to get behind this year’s campaign as well. ‘I can’t think of any reason why not!’ he says. ‘I know a lot of people who couldn’t make it last time — they would certainly join us. Marine conservationist Lucy Agace led a successful litter crusade of 25 people in Brighton, East Sussex, last year. Lucy was inspired to join the Daily Mail’s Great Plastic Pick Up campaign after spending 30 years as an underwater photographer. ‘Tiny microparticles of plastic are part of the sea now and affect everything that comes out of it, anywhere,’ she says. Property developers Steven and Carolyn Sparks recruited 22 volunteers for a litter-pick on the south side of Lewes last year and are joining The Great British Spring Clean crusade this year. ‘With local authority cutbacks, there are fewer litter bins in Lewes,’ says Steven, 50. Angie Cheshire, a retired secretary from Uffculme in Devon, is excited about getting her village involved. ‘We want our shops to stop selling single-use plastics — we don’t want them in the village,’ says the 71-year-old. Former teacher Paul Bridgewater has continued to collect litter since the Mail’s Great Plastic Pick Up. The 67-year-old from Portway says: ‘It’s difficult to measure the impact of last year’s clean- up because it seems to be an ongoing problem in my rural area. 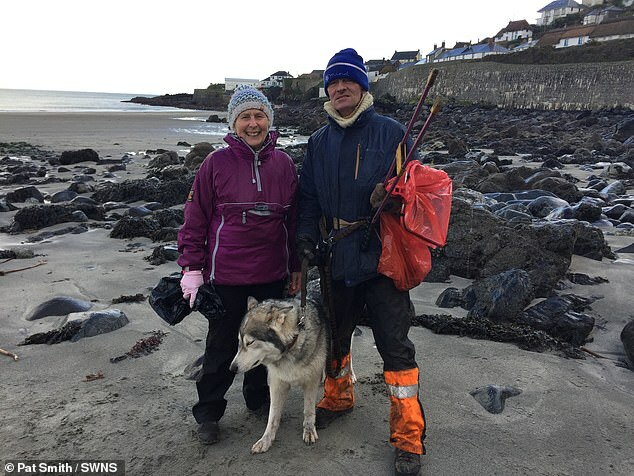 Helen Milford, a teacher at Torpoint Community College, recruited volunteers from the girls’ fitness club to pick up litter on Tregonhawke Beach, Cornwall, last year.